As the library for Western Sydney University (WSU), Western Library has a worldwide reputation for leadership in information, spaces, collections and people. 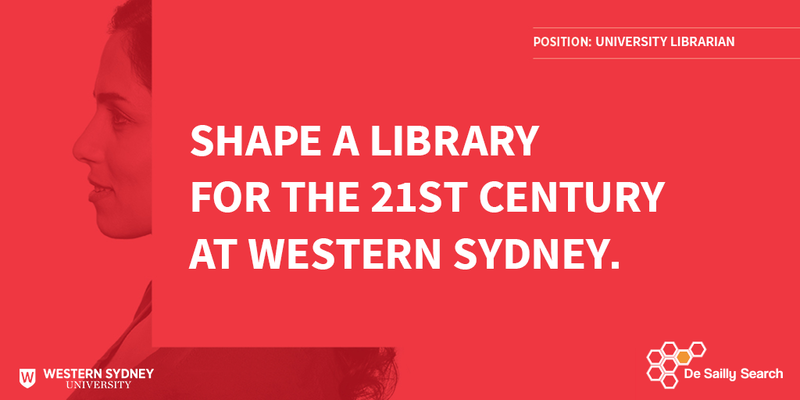 With a busy and expanding footprint across Greater Western Sydney – one of Australia’s fastest growing economic regions – Western Library is an exciting place to be. Ranked amongst the top two per cent of universities in the world, WSU values academic excellence, integrity and the pursuit of knowledge. Western Library is key to the University’s creating unlimited opportunities for students and staff to reach their potential. Western Library succeeds with Western Sydney. The library is ISO 9001:2015 certified to ensure quality of its operations. The next University Librarian will have the ability to respond to the needs and priorities of a complex university environment, and can conceptualise, lead and execute a high-quality, sector-leading set of broad services, working in collaboration with the library team and a range of internal and external stakeholders. the full contact details of three referees who may be contacted by the University. Please state your relationship with the referees and rationale for their nomination. The referees will only be contacted with your approval. Please ensure that the referees are willing to speak on your behalf. Input from other people may be sought as part of the due diligence process.